Why Listen to Classical Music? Professor Craig Wright: Okay. Good morning, ladies and gentlemen. My name is Craig Wright and this is “Listening to Music,” the most basic course that the Department of Music has to offer. Its aim is to teach you how to listen to music. “Wait a minute,” you say. “That’s preposterous. I listen to music all the time. I’ve got, what, my iPod, I’m downloading mp3 files, continually swapping files. I’ve got my car…” (What do we call those things in the automobile where you — Is it a DAT tape that you can take your iPod and plug it in to the — your — the stereo system in your car?) “I’ve got that. I listen to music in my dorm room off my computer, in the bookstore, wherever. I bet I listen to a lot more music than you do, you old goat.” And you’re right. You probably do. But what kind of music are you listening to? Well, probably pop music and that’s fine; that’s okay, fair enough, pop music. But are you getting the most out of this particular experience? Are you getting the most out of your listening experience? I contend that perhaps you are not, that you are not maximizing the time, using that time most profitably. How do I know this? What makes me think that you are not getting as much as you possibly can out of your music? Well, experience, to some degree, but also an experiment that I did just last weekend. I have four children. The last of the four has now turned seventeen so I said last weekend — he’s always with the iPod on — “Chris, what are you listening to?” “Go away. You’re bothering me.” Okay. “You’re ruining my life again.” So [laughter] “Well now, come on. Let me listen to this. Let me listen to it. What are you listening to?” So I listened to it and I said, “All right. Here, you listen to this and tell me what you’re hearing.” And what did — what was he tracking? He was tracking the text; he was tracking the beat of the piece. I asked him, “Well, what’s the mode of the piece? What’s the meter of the piece? What’s the bass doing? Can you follow the bass line there? Can you identify any chords in this particular piece?” Nothing. Zero. And this from a reasonably sophisticated kid who’s had twelve years of serious cello lessons, and that brings up, I suppose, a point: that although I don’t know much about your music I think I can teach you a great deal about your music by using the paradigms of classical music. So I’m going to tell you a lot about classical music in here: Mozart, Bach, Beethoven. It will be the locus of our course. How many of you already listen to classical music? Raise your hand. Okay. Great. A lot of you and that’s wonderful. I’d be interested to know, gentleman down here, how do you do this? Is it streaming off of your computer? Are you downloading mp3 files and saving them? How — Tell me. How do you do it? Student: I just go to YouTube. Professor Craig Wright: You go to YouTube. All right. Very interesting. I should have known that but I didn’t. You go to YouTube and you listen there. Anybody else do it a different way? Yes? Professor Craig Wright: On the radio. Okay. That’s interesting. We’ll come back to that point. Anything else, anybody? Yes? Student: My parents’ CDs or records. Professor Craig Wright: Okay. Your parents’ CDs or records. That’s wonderful. They have sort of the old technology here but some of those old recordings might be very, very good. Now here is a question for you. Why would we want to listen to classical music? Why do — why — who just answered a question for me, those folks who raised your hand? What — gentleman here again. I’ll — you’re my sacrificial lamb this morning. Why do you like to listen and why would you want to listen to classical music? Professor Craig Wright: Okay. Very interesting. National Public Radio asked exactly this question in a survey a year or so ago and they got the following principal responses back. Why do people listen to classical music? One, it helps them relax and relieve stress, so this is perhaps the principal reason. Two, it helps us center the mind, allowing the listener to concentrate. Three, classical music provides a vision of a better world, a refuge of beauty, of majesty, perhaps of even — of love — and sometimes, at least for me personally, it suggests that there might be something out there, God or whatever, bigger than ourselves, and it asks us to think sometimes, think about things. That’s what I think these great fine arts do, great literature, poetry, painting, music. They show what human beings can be, the capacity of the human spirit. They suggest to us as indicated maybe there is something, a larger spirit out there than ourselves, and they get us to think. They get me to think frequently about what I’m doing on this earth. What are you doing on this earth? [laughs] Don’t answer that. What am I doing on this earth with regard to this particular course? What am I trying to accomplish in here? Well, maybe two things. One, change your personality. I want to make you a richer person, a broader person, by instilling you with an unending deep and abiding understanding of classical music, so that’s part of this, and not just here for Yale but for your life after Yale. I would hope that how you lead your life ten years from now, twenty years from now, thirty years from now, would have been significantly influenced by this particular experience in this course. And secondly, if I’m successful in my teaching I will accomplish this second aim here. I will impart to you a love of classical music. You, through, later on after Yale, your attendance at concerts, buying of one fashion or another, downloading mp3 files, iTunes or whatever it happens to be, maybe being members of your local symphony board, opera company, something like that, maybe giving music lessons to your children, you will become the purveyors of classical music thereafter. You, the intelligentsia of the next generation, will be those that preserve this great treasure of Western culture and it is a great treasure of Western culture. Okay. How are we going to do all of this? How are we going to accomplish these two things on our list of agenda here? What are the mechanics of the course? Did you all get a syllabus? Everybody’s got a syllabus? The first three or four weeks or so we’ll be following the elements of music: rhythm, melody and harmony — and then a test. Next we will deal with what’s the — arguably — the single most important thing when we listen to any piece of music and that is its musical form. Here is a question for you. I was thinking about this the other day as I was preparing the lecture for today. What’s the most common type of musical form in pop music? When you listen to pop music do you ever think about the form of the music? Can anybody name a form of pop music, any one form? Well, maybe verse and chorus? Think about that. That shows up in a lot of stuff and we’ll come back to that. We’ll talk about verse and chorus when we get to the issue of form. And then toward the end of the course we will turn to the question of musical style. How does a piece of pop music differ from a piece of classical music? We sort of all know this intuitively but can we articulate why? This particular difference about musical style was driven home to me the other day. It was last Friday. I was walking across the campus — maybe you saw this too, corner of Elm and College. There was a large flatbed truck out there and there were these people on this truck getting you — trying to sell you audio equipment, and they had a big banner up there. It said “Pump Up Your Room.” Okay? So then to encourage you to “pump up your room” they had music playing and this is the kind of music that they had on that flatbed truck. [music playing] Okay. I’m feeling very pumped up at that particular point [laughter] and my cell phone rings. Okay. My — This is true. My cell phone rings and because one has the capacity nowadays to select your own ring tone — right? I have mine selected not to that sound but to Mozart, so I hear this sound on my telephone. Can anyone tell me? What’s the difference between these two? What’s the — what did the pop piece have? That’s Rave ‘Til Dawn. That’s my — I own that album, I’ll have you know, Rave ‘Til Dawn. Gentleman back here. Student: In classical music there’s much more attention to detail. Professor Craig Wright: Yes, that’s probably true as a general observation, whether it comes through clearly on these two — this comparison — I’m not quite so sure, but there — I wouldn’t say there’s a great deal of detail in the first one. There’s a lot of repetition. That’s where I — once that gets going, it goes for a long period of time. Anything else? Yes? Professor Craig Wright: Oh, melody. Which one had the melody? Professor Craig Wright: Okay, in the Mozart there were violins, so acoustical instruments as opposed to synthetic sound with regard to the pop music. So what we will be doing is differentiating pop from classical and also differentiating within styles of classical music. You’re driving down the road, you … who is the FM listener? Over there … You turn on your radio, your car radio, to your FM classical music station and what number approximately would you go to? Professor Craig Wright: Okay. 98. That’s pretty high. What town is that? Do you know? Professor Craig Wright: Oh, that’s Chicago. Well, they’re Elevated people in Chicago I’m sure. [laughter] Normally, where you go is all the way down in the low numbers. Particularly, here in Connecticut it’s 89.5, 90.1, 90.5. My favorite is 91.5 (WMRN). Generally speaking, when you want to find classical music you go to the left of your FM dial and fish around down there in your National Public Radio. Okay? So that’s how we do it, but you got your car radio going. The music comes on. Is it baroque or romantic? Is it medieval or modern? Is it Bach or is it Beethoven? 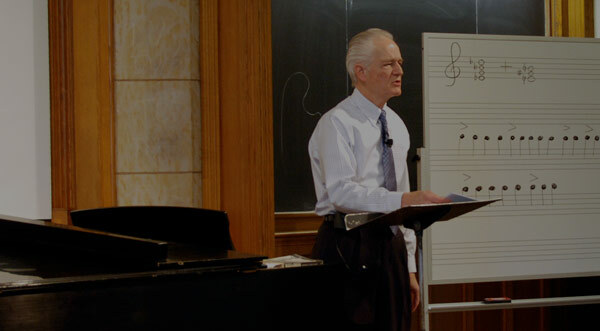 Well, those sorts of answers, those sorts of issues, are the sorts of things that we’ll get to when we come to the question of musical style toward the end of the course. Okay. Materials. Textbook. Here is the textbook. It is my own textbook, Listening to Music, now in the fifth edition. I’m very proud of it. Actually, it’s used all across the United States and used across the world, about to come out in a Chinese edition for heaven’s sakes. What was it? It was simply my lecture notes from this particular course that I’ve been teaching here for a long time. I had these lecture notes; I had all of these listening exercises; I basically just put it in a textbook. So this is all material for Yale students, Yale — material designed here at Yale for Yale students. At the back of the book — I think I took mine out but at the back of the book you will see wrapped with it an intro CD, introductory CD. You might be interested to know that a lot of the material there actually recorded by Yale undergraduates. We paid them for it. We paid people across the street at the School of Music but this again is kind of native local Yale produce here. So we have to — We get the textbook and then with the textbook we recommend getting access to this six-CD set. Okay. Requirements. You can see this on the sheets too. You’ve got a couple of tests here. We have to write a short music paper. We’re all going to go to a concert. I think this year we’re going to go hear the Saybrook Youth Orchestra. And I put on the sheet this year — I think I’m going to try to count five percent for class participation. We will be taking attendance in the lecture. Yeah, I know. It’s babyish. I’m sorry, but I take this very seriously. I really do. It’s my lifeblood and I want you to take this seriously too. I want you to come to class. I want you to come to lectures, so we have the two lectures each week that you’ll come to. Sections are also mandatory. We have three wonderful specially selected TAs in here. I’ll introduce you to them next time. So come to two lectures, one section, and do the work regularly. Now, sections. They start on Thursday and go through a Monday cycle. They do not start tonight. They start next Thursday in the cycle. You can go online and sign up there but you’re still shopping so we’re not starting sections tonight. You may not — may or may not be taking this course. Do the assignments, these listening exercises, on time. Music is an aurally perceived phenomenon. You can’t cram information about music, the sound of music, into your head the night before a test the way you might be able to in an English course or a history course. The way we hear music, the way our mind processes music, is very, very different from this other kind of information, very different from history or economics. To make this point, let me see if we can get my helper here, technical person, to bring up a slide for me, and my question to you is — as this slide comes up — is the following: where in the brain is music processed primarily? Where do we process — Anybody know the answer to that? Anybody who take psychology courses, neurobiological courses? Yes, young lady out here. Do you have a sense of that? Professor Craig Wright: The left side of the brain. That sounds like, well, maybe the old creativity theory. Could we — And that’s possible. In a way it’s correct. Anything more specific? All right. Here’s our brain. We took this off of the internet. All right? That’s why it’s all in French, because it’s not copyrighted, and we have to be careful with that in here with these camera rolling — cameras rolling. So we have the tronc cérébral down there. It just means the brainstem and the cerebellum and then the temporal lobe, the frontal lobe, the parietal and the occipital lobes. Now where is music and language processed? Anybody? And there is — Is somebody raising their hand? Student: Well, the temporal lobe is where your hearing occurs. Professor Craig Wright: Yes, the temporal lobe is where your hearing goes on. It doesn’t matter whether you’re hearing language or whether you’re hearing music. This sort of processing happens in the primary auditory cortex, both left and right, of the temporal lobe. But it’s more complex than that. Let’s say I had to remember to play something at the keyboard. Well, there I might be factoring in the frontal lobe because much of the short-term memory in particular is in the frontal lobe. Let’s say I went to play a piece [music playing] Now I didn’t think about that. Actually, a minute ago I didn’t even know what I was going to play but I remember that. Am I thinking back there, “Well, it starts in C and that’s got an E up there and it’s got a G”? No. It’s like athletes. It’s muscle memory. You do that eight billion times in your life and you can hit a good top spin backhand. It’s muscle memory and that happens in the — that’s mostly in the parietal lobe. Here I’ve got to scroll up here if I’m looking and then I’ve got the visual cortex engaged. So doing music, if I’m sight reading, playing, it’s a very complex thing, but most of the — most of this music and language processing happens in these — the — as I mentioned — the left and right auditory cortex. Therefore — Where am I going with all this? Therefore, the pedagogical techniques that we use in teaching “Listening to Music” are virtually identical to those that we use in teaching language. There is a great deal of similarity here because it’s just processing sound. This was a point — I was listening to some National Public Radio thing the other day — and listening to something that had a psychologist talking about the correlation between sound and music, and he said it was something about — he said music is sometimes very strange, sometimes very strange, sometimes very strange, [hums], and that sort of brought home to me the text is irrelevant, the idea that music really is sound and that language is just sound. There’s a very thin line between the two and we therefore use the same pedagogical methods in the sense that we’ve got to do the following. If you ever read the course descriptions of French 115 or Chinese language, basic intro to Chinese, they say — I think I wrote it down here, this process of gradual assimilation. Yes. Daily participation in language labs required. So daily is the key thing here. You’ve got to do this gradual assimilation. So learning to listen to music is just like listening to language. We’ve got to do a little bit every day. You’ve got to turn in these listening exercises in a regular fashion and come to class. This is a beginning course. I assume that you know nothing, starting from ground zero here and build it up. All right. I’ve talked — I’ve droned on here. Let me ask you if you have questions about the course in general and do you have questions of me at this point? Yes, the gentleman in the back. Student: What are the formats of the tests? Professor Craig Wright: The formats of the tests will be very clearly laid out for you. There’ll be a little bit of written work. There’ll be a fair amount of listening. You will be given a list of pieces that you’ll have to prepare for a little bit and then we will play out of those particular pieces, but most importantly, I will give you a prep sheet. Each test comes in advance with a prep sheet telling you how to get ready for that particular test. Good question though. Thank you. Anything else? Okay. If not, let’s go on to the following. We’re going to have a diagnostic quiz and you are taking a quiz the first day. Now that’s on the back of your handout there. This is not really a quiz ‘cause we’re not going to collect it. You can throw it away going out. It’s in here to — intended to do two things: One, to show you something about the method that we will be using in here and two, to show you something of the level of this course — the level of the course. The questions that I’m asking on this quiz — the questions asked on the quiz — are the types of things we would expect you to know at the end of the course — not now, but at the end of the course. Some of these are difficult. So if you find yourself getting most of these answers correct, then don’t take this course. You’d be wasting your time, wasting your money here, so don’t do this if you find at the end of this you’ve got sixteen, seventeen, eighteen of these correct. All right. Let’s start with a little bit of classical music here and this engages questions one and two. Who is the composer of the piece that you’re about to hear and what is its title or what’s it called? [music playing] Okay. So let’s — I’m going to ask them to queue the next piece here while we talk about that just for a moment. The composer — Anybody know the composer of this? Raise your hand. Okay. Some people do. Some people don’t. Gentleman over here, in the dark shirt. Professor Craig Wright: Okay. That is Beethoven, Ludwig van Beethoven, and do you know the name of the piece? Professor Craig Wright: Okay. Symphony no. 5. Now if you’re sitting next to this gentleman — Oh, god, this guy knows so much. I’m going to go down the tube in this course. No. Don’t be intimidated by this. As I say, we’re going to build everybody up here together. So that was Beethoven’s Fifth Symphony, the beginning of it, a famous passage in the history of classical music. Let’s listen to another composition here. Who is the composer of this and what — in what composition is this piece used? [music playing] So who is the composer of that? Does anybody know the answer? Fewer people do. Young lady out here in the green, did you have your hand up? Professor Craig Wright: Again Beethoven. What’s — what’s the — in what composition does Beethoven use this particular piece? Does anybody know? Gentleman here? Professor Craig Wright: Ode to Joy. So how does Beethoven go about making the Ode to Joy joyful? What does he do here? This is what we’re going to be doing in our course. We’re going to be zeroing in on this music. Can anybody tell me why to a person in this room we all responded positively to the Ninth Symphony and somewhat more anxiously to the Fifth Symphony? You have to tell me one thing. Let me take the rhythm out of it. [music playing] That’s a bit skippy, isn’t it? Doesn’t that move around a lot? Whereas the — if I take the rhythm out of the Ninth Symphony [music playing] really Beethoven there is just going up and down a scale so it’s very conjunct. We have the difference between conjunct music with the [music playing] and disjunct music [music playing] and that perhaps adds to the unsettled quality of the Beethoven Fifth Symphony. Here’s something else and I guess it’s a quiz question I think I’m asking you there, and it has to do about a home pitch. Music gravitates around a home pitch and in the Beethoven Fifth Symphony [music playing] we still haven’t gotten the home pitch. We go that far and we still haven’t heard the home pitch. Can anybody sing the home pitch? [hums] [music playing] But he hasn’t given it to us and maybe that’s why this sounds so disjunct and so unsettled, apart from the skippy nature of the melody, is that we are not given at the outset the home pitch whereas with the Ninth Symphony, [music playing] second phrase, that’s the home pitch there and we all feel sort of secure in that home pitch. Professor Craig Wright: Down. It’s generally going down. So the direction that music goes can also affect how we feel about it, our mood about it, so I think the next question — I play another piece for you. I want to play this one with the piano a little bit and I ask you the name of the composer of this piece — it’s a bit less well known but maybe not — what it’s called and when in the history of music it was written. [music playing] Anybody know that piece and the name of the composer? Yeah? Professor Craig Wright: Okay. Debussy, a French composer writing at the end of the nineteenth century in the Impressionist style, and the piece is called Moonlight — Clair de Lune — but again you may- you’ll come out of this course — four months from now you’ll know all of this stuff. Now you’re not supposed to know any of this. What I’m interested in is your emotional response to this. How do you feel about this music? What kind of mood does it put you in? [music playing] Now how do you feel about that? Anybody want to tell me about that? Professor Craig Wright: I beg your pardon. Oops, I heard — Nice and loud please. Professor Craig Wright: Serene. Yeah, serene. Why does it feel serene? Boy, I wish I could play my Rave ‘Til Dawn CD now. Right? [simulates playing music] Okay. There’s no beat to it. All right. It’s very languid in terms of the pulse here. It’s very understated in terms of a beat. You’d be hard pressed to identify what the meter of that is so that’s one reason, and of course what — where am I going with the next important point about what’s happening in this music? It makes us feel serene, relaxed, because it’s all going down [music playing] and only when we get here [music playing] do our spirits soar upward at that particular point. So again, direction in music also is important with how we respond to it. So what are we going over here? Major versus minor? Disjunct versus conjunct? What else? Strongly felt tonal key, which is called — I don’t know if I mentioned this or not — the tonic key, the tonic pitch, the tonic pitch there, and this idea of the direction of the music. All of these we’ll have to be thinking about as we listen to music in this course. Okay. Now let’s see. I think I want to do the following. Yeah. Here’s a question for you. Here’s a question, a completely different subject here. What are the two dimensions of music? Think about dimensions of painting or architecture perhaps but what are the two dimensions of music? Have you thought about that? Can anybody give me one? Well, pitch — Oh, yeah. I’m sorry. Okay. Pitch. And what would the other one be? Time. Okay, pitch and time and pitch and duration, excellent, so those are the two dimensions of music and well, indeed we could even call them the axes of music because we tend to think of pitch on a vertical axis. We talk in terms of high pitch and low pitch although we’ll fine tune that next time, and then we have this idea of duration or time, which we tend to write out in symbols that move from your left to right. So what I’d like to do now is focus on a piece that emphasizes — foregrounds — just the first axis, pitch. Here is a question for you. How many of you have heard Richard Strauss’s Also Sprach Zarathustra? Okay. How many — and be courageous here — how many have not heard Richard Strauss’s Also Sprach Zarathustra? Raise your hand nice and big. Okay, the overwhelming majority of people say they have not. Wrong. You all have heard this many times. It’s used continuously as a movie score, television, radio commercials. It’s all over the place, and as soon as I start to play it, at least once we get in to it, you’ll say, “Oh, yeah, I’ve heard that.” So this is a piece by Strauss where he’s trying to resurrect the content, or mirror the content, of a philosophical novel by Friedrich Nietzsche, Thus Spoke Zarathustra, and it’s about the unleashing of human capacity as it comes forth from the primordial earth here. And in Strauss in attempting to do this will use the orchestra to depict here in this particular case perhaps the rise of human power, maybe as metaphorically represented by the sun, so here is Strauss depicting the rise of the sun. So the brass instrument is the — is a — trumpet. Okay? That’s what that is. It’s coming up there. Let’s talk about what we’ve done on the board here. We can see we have these low pitches, [hum] What did I just sing? [hums] Almost the same sounding pitch. Right? Well, we’ll talk about this. This is called an octave. [music playing] It has to do with frequency ratios that we’ll go in to a little bit next time. So he’s coming up initially just through octaves. [hums] Then the next pitch on the trumpet [hums] is actually an interval of a fifth. [hums] That’s a fourth [hums] but it happens to produce an octave [hums] against that. Then the first time [hums] so he came up a major third there and then quickly backed off with just a half step below it, which completely gave it a different feel. So a bright, shiny major and then dark minor. [hums] Then a percussion instrument came in. Anybody know what that was? Okay. Tell me what it was. Nice and loud. Yell it out there. What’s happening and interests me acoustically, and again we’ll come back to it, is that we’re getting up toward here, and notice how these pitches in terms of the ratio frequencies are getting very close together. So we’re going to go [sings]. You sing the next note. [sings] There it is up there. Okay? Good. You got it. Come on. Louder. [sings] Coraggio! Okay. So there we are there. My question on the quiz is what’s this one called? [sings] Okay. So this is a leading tone going in to that particular note. So let’s listen to here again just the very end of this with the spectacular sound of the orchestra, [music playing] and there at the end you could hear the organ a little bit better. So that’s how using some of these basic ratios gives us this primordial type of music and it’s quite spectacular. It’s quite spectacular because here in the 1890s we have the apex of the Western classical orchestra, this big, beautiful, powerful instrument. Okay. We’ve talked a little bit about pitch here. Let’s go on to talk about the other axis of music and that is rhythm or duration. Now in music as you probably know — we’ve already talked a little bit about this — we have the importance of the beat. The beat’s very important in music and generally speaking, in music, we divide the beat. We organize it into groups. The beat’s kind of like the heartbeat. It’s kind of like the basic pulse of [hums] but, given our psychological makeup, we tend to divide these up into units: so generally two and generally three, and if we have groups of two we call that duple meter; groups of three we call that of course triple meter. How do we indicate these? Well, by some kind of conducting pattern. We’ll come back to this. You’ll all be conducting in here. So duple is just one, two, one two, one two, one, [sings], one strong beat, one weak beat, strong, weak, strong, weak, in that fashion, and conversely of course triple is strong, weak, weak, strong, weak, weak, with two weak beats between each strong beat. So here’s a question for you. Who wrote the musical, and it’s on your quiz there, Chicago? Anybody know the answer to that? How — Okay. How many don’t know — a rousing show of hands here — don’t know who wrote Chicago? This is amazing to me. This guy is the stealth bomber of music. How nobody could know the name of this person that has given us so much great music, Cabaret, Chicago, songs that you go on singing, have in your ear all the time, John Kander, lives down in New York City, writes a lot of this stuff. So we’re going to listen to a track out of John Kander’s Chicago here, and the question that’s at — in play at the moment is what’s the meter of this cut from Chicago? [music playing] Okay. Here’s something that may interest you. We’ll be playing a lot of pop music in here but they will generally be short clips of pop music. Why is that the case? For copyright reasons, that’s right. So we’ve heard a passage here. What was the meter of that section? Gentleman down here, you seem to be moving with the music, which is very good. What did you think? Duple or triple? Professor Craig Wright: Okay, duple. Now I would come — That’s correct. I would come right back to you with yeah, you intuited that but can you explain to me what you were hearing? What did you hear that allowed your brain to instantly go to that decision, make that correct decision? Any ideas? Anybody. Professor Craig Wright: Okay, cut time. Professor Craig Wright: What? Accent on one, but what part of the music were you listening to? Professor Craig Wright: Yeah. Yeah, that’s it. Somebody’s up there going [sings] and it’s actually the bass so we’ll be wanting to zero in on the bass in a big way in music [hums] because that’s oftentimes giving us much more information than the melody. [hums] So there we had an example of duple. Let’s see. Have we got another excerpt here? Let’s listen to a little bit of that. [music playing] So what about that one? Professor Craig Wright: Yeah. You know the setup here. We did duple and now we’ve got to do triple. Okay. So that’s strong, weak, weak, in that fashion. All right? Now let’s listen to a little bit more of this, and something interesting happens to the beat. It slows down. What do we call the passage of music in which the beat slows down? What’s being applied? What’s being affected here? What’s being used here? [music playing] Okay, a very simple word there: Ritard. Okay? So the music is retarded. We have the pulse being slowed down and almost like a law of physics or something, now comes a reaction — now John Kander makes the music accelerate so let’s watch a wonderful example of accelerando here. [music playing] Let me hear it. Okay. So at that point the music begins to speed up with the accelerando. Now [music playing] getting close [inaudible] drive to the end. Do you ever notice this in musical compositions? Keep an eye out for this, particularly in pop music. They’ve got an idea but they’ve got to fill up a track. They really need a good three minutes and thirty seconds here. They’ll have something going and then almost unbeknownst to you they will take that and lift it up in terms of the pitch content. What is that called when you change the fundamental pitch in a piece, going to a different pitch level? Anybody know about that? Called modulation and this is sort of where we’ll be really, really four months from now, modulation. It’s very subtle. A lot of what we were doing today is very straightforward, the idea of duple versus triple meter, but most modulations we don’t usually hear. Okay. So these are the kinds of things we will be doing. If you decide to take this course, get a hold of the materials for next Tuesday, do listening exercises one and nine through eleven. I’ll see you then.